Lionfish are a rapidly advancing invasive marine species. They eat juvenile fish, reducing the diversity and native fish population on some species by up to 95%. So, what to do with these creatures? As with all problems, my own personal answer involves food. So I have always been interested in the idea that we can best manage these invasive species by eating them. 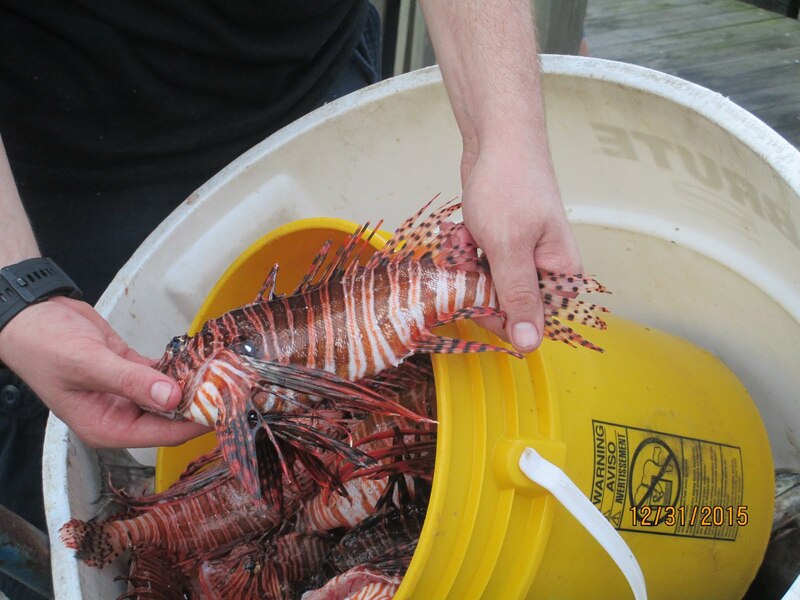 Proponents of this plan don't just want to get people to eat lionfish occasionally, but instead they want to develop a cultural and social acceptance of the organism as a commonly consumed species of fish. This is a lot harder than it might seem. The first was a large influx of immigrants from Europe (and especially Germany). The second was a noticeable decline in native fish stocks (I say noticeable because they were probably declining for some time and it wasn't until this period when fishermen sounded the alarm). These two occurrences (increased immigration and decreased fish stocks) were not causal (no, immigrants didn't steal our fish) but they did mean that there were more people and less fish to feed everyone. So the newly created U.S. Commission of Fish and Fisheries decided to do something about this: they would farm carp and release it into nearly every part of the US. 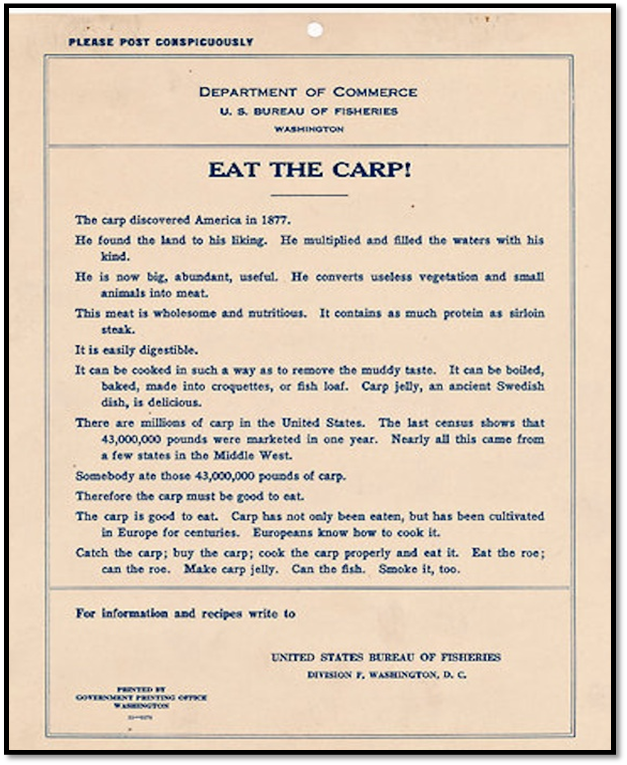 Carp was already a popular ornamental and food fish in Germany- so the US Commission thought that the introduction of this species would be a win-win. 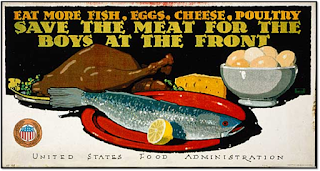 They already knew that immigrants considered this an acceptable food source and they assumed that the fish would become popular with other Americans as their native fish stocks declined. What could go wrong? But excitement about carp was quickly replaced by disgust and annoyance. Farm bred carp were kept in squalid conditions: the fish are hardy and thrived in muddy, murky ponds on basically any food. However, they also take on the taste of those muddy, murky and garbage filled locations. Complaints flooded into the Commission that the fish were inedible. In addition, the stocking of lakes and rivers lead to an overabundance of the species. The German carp began to push out the already declining native species. 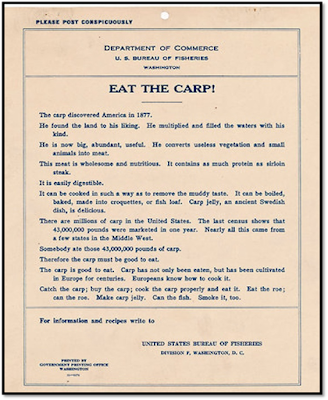 For those fisherman interested in trout, the carp was a less beautiful and sporting fish, regardless of taste. This poster seems a bit informal, exasperated, and slightly grasping. I'm not sure it's particularly convincing all things considered. And they were particularly interested in promoting all fish during WWI and WWII because of meat shortages. But alas, similar to fetch, carp was never really going to happen. There are other instances of trying to interest people in eating invasive species, especially when those species have overtaken and threatened the food source upon which those populations used to thrive. For instance, the oyster and mussel populations in Cancale, France are being crowded out by the invasive Atlantic slipper snail. While locals refuse to eat the snail, which they consider little more than disgusting vermin, one entrepreneur is trying to interest high end Parisian restaurants in the species. No one quite knows how the lionfish, native to the Indo-Pacific found its way into the Atlantic. The first sightings in Florida occurred as early as 1985. What we do know is what has happened since then. Lionfish have invaded the Caribbean and Atlantic seaboard. They have been spotted as far north as Rhode Island and are beginning to work their way into estuaries. The hope that lower salinity would stop the spread of these fish inland has been smashed by the realization that they have broad salinity tolerance, meaning that they will have an impact on both reef ecosystems and broader littoral and coastal ecosystems. One of the concerns with harvesting and processing lionfish is understandable: they have poisonous spines. Those spines can remain poisonous up to an hour after they are caught. Learning to properly clean the fish is the first step to eating them. After they are cleaned, they can be cooked like any other fish. Many people compare them to grouper or other salt water fish. I was lucky enough to get to try lionfish this winter while vacationing in Cape Canaveral, FL. Grills bar and restaurant has started serving lionfish and I was excited to get to contribute to ecosystem conservation by eating and drinking beer on a deck in 80 degree weather. This is the type of conservation that Americans really like! 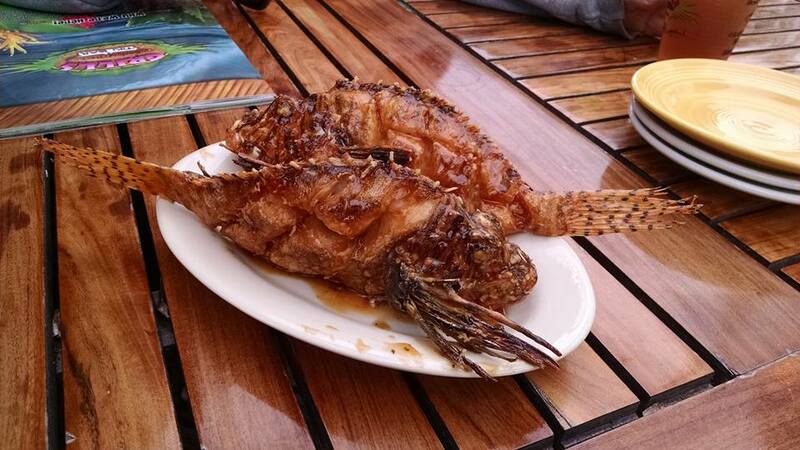 Grills prepares their lionfish by frying it and then broiling it (something they call froiling) and they serve it with a type of teriyaki sauce. The fish is a huge amount of meat- in fact, we shared the appetizer above and it was overwhelming how much of the fish is actually meat. The flesh is similar to any white fish you might have had- it doesn't taste "fishy" (a common complaint about fish because apparently people like to eat food that doesn't taste like food and while I find that confusing I accept it). In fact, it doesn't taste like much at all, so I think that would be a great hit with consumers. There are a lot of tiny bones if you don't fillet it first, but the fish is so good it is worth the effort of weeding them out. One of my favorite things about the lionfish is that its skin is edible. While many people don't like to eat fish skin, I absolutely love it. The taste and texture are something that appeal to me (I love trout and catfish for this reason). Lionfish skin is really good and on a fried fish like the one above, it was probably my favorite. part. All in all, I hope that the lionfish catches on in the US. If it doesn't, it won't be because it isn't good to eat. I would order it as a regular entree, even without the added incentive of eating invasive species.